The stunningly animated Mean Teddies reveals what stuffed toys get up to while children sleep. When nightmares threaten to run rampant, these plush creatures come to life to fight on behalf of their children. Tyler Novo's animated short has a vaguely similar concept to the horror segment Teddy Scares, which we saw earlier this week. 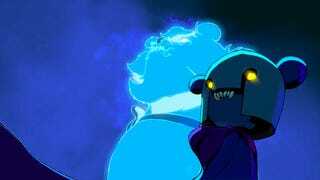 But Mean Teddies has a much more epic feel, with an immediately accessible mythology behind it. And there's something comforting behind the thought that a teddy bear can bare its teeth as readily as any monster.